This year the aim of the ringing was to continue recapturing as many weavers as possible, including those that had been ringed as weaver chicks). At the same time much ongoing data was obtained for survival and movements of weavers and other species on the Cape Peninsula. The ringing effort was less than in 2010. 38 species were caught, with a total of 1276 ringed and 308 recaptured (these totals do not include ringing by Sally, Felicity and others). A full species list of captures on the Cape Peninsula is given in Table 2 below (see also totals for 2008, 2009 and 2010. 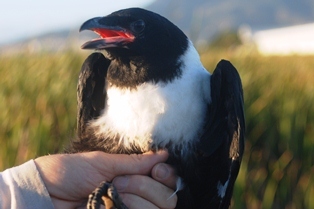 A photo gallery showing bird ringing events in the Cape Town area may be viewed here. To join bird ringing events in Cape Town, check dates on this calendar. The weavers caught were lower than 2010 due to less effort. The recapture rate for Southern Masked Weavers was up (also that of Yellow Bishops but in this case the reason is due to lower new birds being caught). The top four species ringed were Southern Masked Weaver, Cape Weaver, Southern Red Bishop and Common Waxbill. The highest recapture rate (where at least 10 birds were ringed) was for African Sedge Warbler, and then Yellow Bishop. Funding was previously gratefully received from the African Bird Club Conservation Fund and the Cape Tercentenary Foundation to study natal dispersal in weavers.